The national flag of Ireland is referred to as "the Irish Tricolor," comprising three vertical bands: green, white, and orange: the green stands for the older Gaelic tradition, the orange represents William of Orange, and the white is the truce that was struck between the Orange and the Green. These colors also represent the Indian flag, where "orange" is appropriately referred to as "saffron." The flag's symbolism is beautifully expressed in a bead branded with "Swarovski Crystals," handset with myriad crystals that form a subtly shimmering pavé surface. 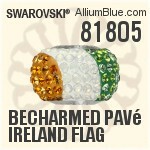 Swarovski 81805 BeCharmed Pavé Ireland Flag consist of lead-free ADVANCED CRYSTAL by Swarovski.